A recent post on The Assistive Technology Daily, “Preserving Memories 140 Characters at a Time after Traumatic Brain Injury” describes Thomas Dixon’s use of Twitter as an AT support for his episodic memory loss sustained in a closed head injury while running. Can social media be considered assistive technology? Dixon reported he was familiar with handheld technology since middle school, but after using a notebook as a tool to assist with memory loss he changed his strategy and created a private Twitter account to record memories to assist with his recall. He describes Twitter, with only 140 characters allowed, as mimicking how episodic memory works. Using Twitter, to log experiences in a linear timeline, with recent events posted on top and the ability to search by keywords made providing the appropriate cognitive support. Considering that any device or tool that supports individuals with improved functional capability, Twitter services on a mobile device with Wi-Fi could definitely be considered as assistive technology. More information on Thomas Dixon’s strategies can be found by searching YouTube with Traumatic Brain Injury? Technologically Beyond it! Part 1, 2 and 3. What a great example of the application of social media as an AT , innovative use of technology by the client to meet their unique needs. Universal design for living! “Assistive Technology Act.” National Dissemination Center for Children with Disabilities. National Dissemination Center for Children with Disabilities, 1 Apr. 2013. Web. 02 July 2014. <http://nichcy.org/laws/ata&gt;. Wishnick, Emily. 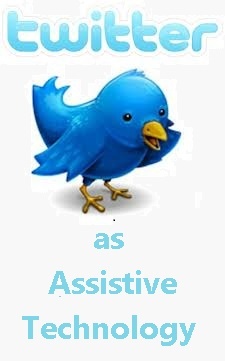 “Twitter as Assistive Technology.” YouTube. YouTube, 12 Oct. 2013. Web. 02 July 2014. <https://www.youtube.com/watch?v=9HXbVNTf_Ks&gt;. Woods, Jeanette. “Preserving Memories 140 Characters at a Time after Traumatic Brain Injury – NewsWorks.” Preserving Memories 140 Characters at a Time after Traumatic Brain Injury – NewsWorks. NewsWorks, 12 July 2014. Web. 02 July 2014. <http://www.newsworks.org/index.php/local/item/68974-preserving-memories-140-characters-at-a-time-after-traumatic-brain-injury&gt;. H/T to The Assistive Technology Daily. This entry was posted in Medical, Memory, Mobile Device Use, Occupational Therapy, Rehabilitation, Traumatic Brain Injury. Bookmark the permalink. I agree! Thank you for your comment!